Pottery or stoneware, relief, 3.0L, inlaid lid. 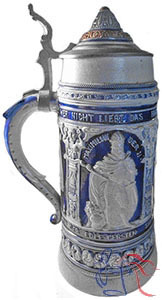 The images on this stein depict three 16th century leaders of the Holy Roman Empire, including: Charles V (1500-1556, Emperor: 1516-1556); Ferdinand I (1503-1564, Emperor: 1558-1564); and Maximillion II (1527-1576, Emperor: 1564-1576). All three were members of the House of Habsburg, one of the most important royal families in Europe and the source of Holy Roman Emperors from 1438 through 1740.